....But I Have Met the Fourteenth Dalai Lama! In Vajrayana Buddhism there are ritual implements and instruments. Many of the Buddha images hold one or two, or many of these, depending on how many arms the particular Buddha is displaying. All of these implements have meaning. Each is there to engage our busy minds in a way that will lead us toward the Truth. Those held in the left hand relate to wisdom, the realization of the emptiness of all phenomena, and those held in the right hand relate to skillful means, or compassion. The bell and dorje are two of these implements. The dorje, held in the right hand, represents skillful means, and the bell, held in the left, represents wisdom. Together these ritual implements represent the inseparability of wisdom and compassion in the enlightened mindstream. Looked at separately, each is a great treasure of spiritual meaning. This is a photo of the ones I own. They were given to me after they were used by the Dalai Lama after he spoke at the Kentucky Center for the Arts during his first trip to Louisville. Offering a scarf may seem to be a very simple gesture but in Tibetan traditions it has its own significance and protocol and is governed by tradition. To present a Khata, you first fold it in half length-wise. This represents the interdependence of each other. Then when you offer the scarf to a person, you offer the open edges facing the person you are giving; the folded section will be towards you, which represents your open pure heart, with no negative thoughts or motives in the offering. There are two general purposes for offering Khatas, with greetings and well wishes being common to both: RESPECT/GRATITUDE. For holy sites, honored monks, teachers, dignitaries and elders, the scarf is given with folded hands near your forehead, with a humble bow before them, with head bent over and palms joined in respect. 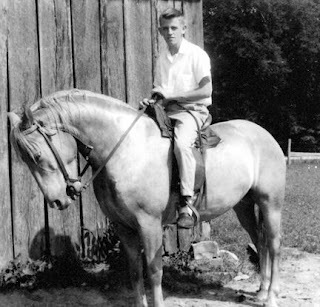 I was the first Catholic seminarian to join the United Church of Christ's A Christian Ministry in the National Parks program in 1968. I was proceed there by the famous American theologian, Harvey Cox, when he was a student. 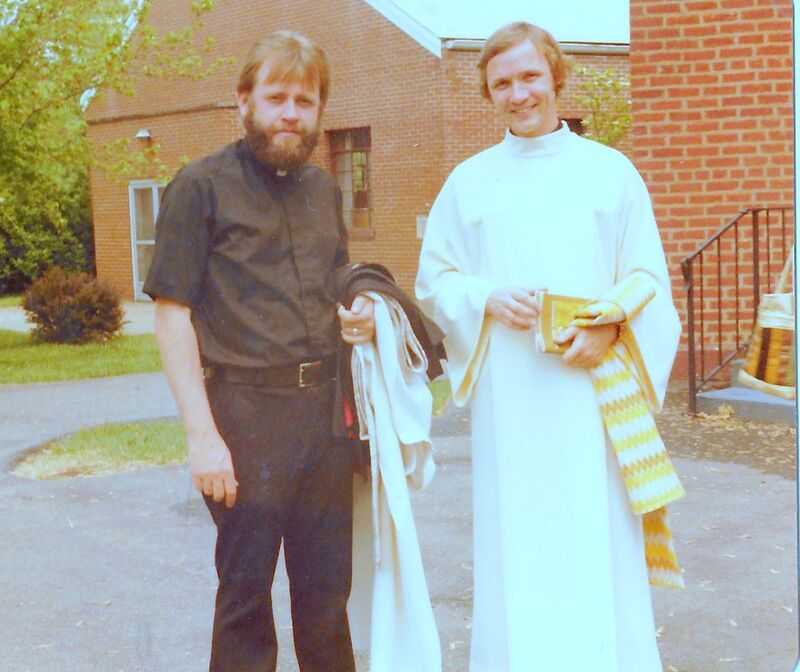 When working at St. Mildred Church in Somerset, Kentucky, from 1975-1980, I started a campus ministry program at Somerset Community College called IF (Inter Faith). 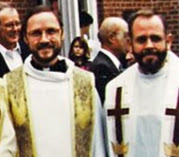 Several other ministers became involved with me: especially Lutheran, Presbyterian, Disciples of Christ and Episcopal. Because of my involvement in Somerset Community College, I had the opportunity to take five back packing trips to Taize (France) where we met up with 3,500 students each week from 70 countries. Taize is an ecumenical monastery in central France (Protestant, Catholic and Orthodox members). It It is the only monastery of its kind in the world. Between 1975-1980, I was pastor of Saint Peter Catholic Church (Monticello) and Good Shepherd Mission Church (Whitley City). 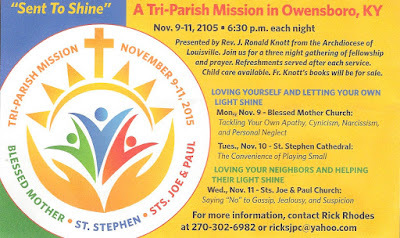 Young myself, and knowing little about the Bible Belt culture, evangelization and starting a parish from scratch almost, I asked the Archdiocese of Louisville if I could go back to school. When the answer was "no," I applied to the Presbyterain Church USA for a scholarship to attend their Doctor of Ministry program out of their McCormick Seminary in Chicago and got it. Three years later, I got that D.Min degree. My thesis was "How One Roman Catholic Mission Church Dealt Assertively With Its Environments" (outside pressure and inside weakness). 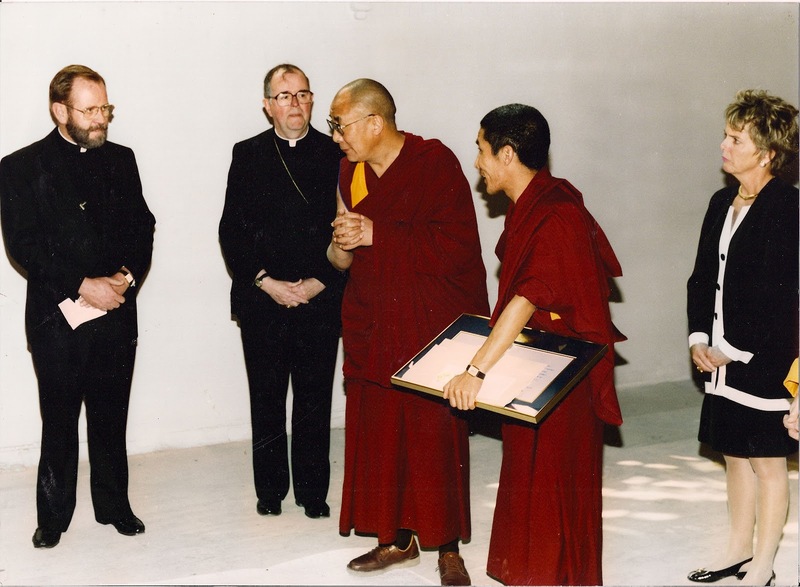 When pastor of the Cathedral of the Assumption from 1983-1997, I helped found the Cathedral Heritage Foundation (now Center for Interfaith Relations) and served as its first president. It has grown into a major interfaith organization that has become world known especially under the leadership of Christina Lee Brown. Along the way, I have attended a Bar Mitzvah in Louisville, a Quaker Service in Berea and preached in a Presbyterian Church and a Lutheran Church in Somerset. No, I have never met a Pope, but I hope to meet Pope Francis someday in a private, one-on-one audience, of course! If you are going to dream, why not dream big! 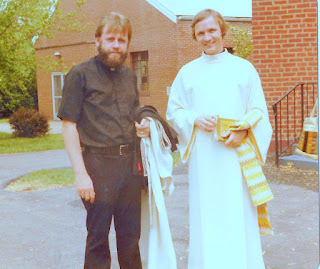 Father Bob Ray and I go back a long way. 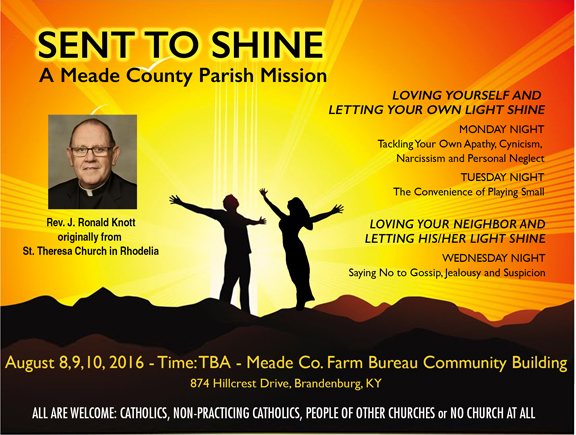 We are both from St. Theresa Parish in Meade County. our beloved Sisters of Charity of Nazareth. 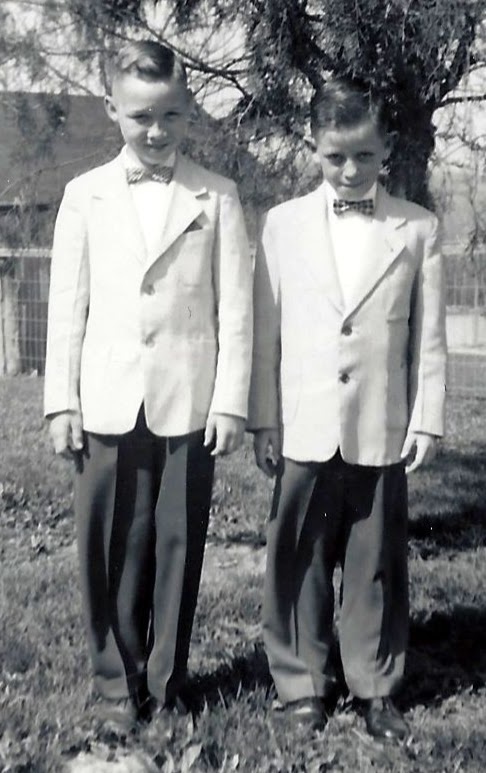 This is our Confirmation picture from 1955. 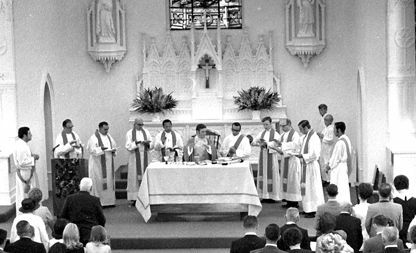 I was 11 years old and 3 years away from going to the seminary in 1958.
both ordained by Archbishop Thomas J. McDonough. 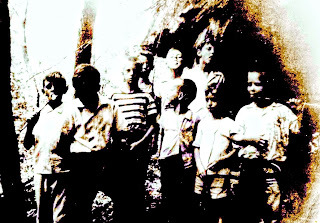 Sometime in the 1970s. I wonder why he always looked younger! 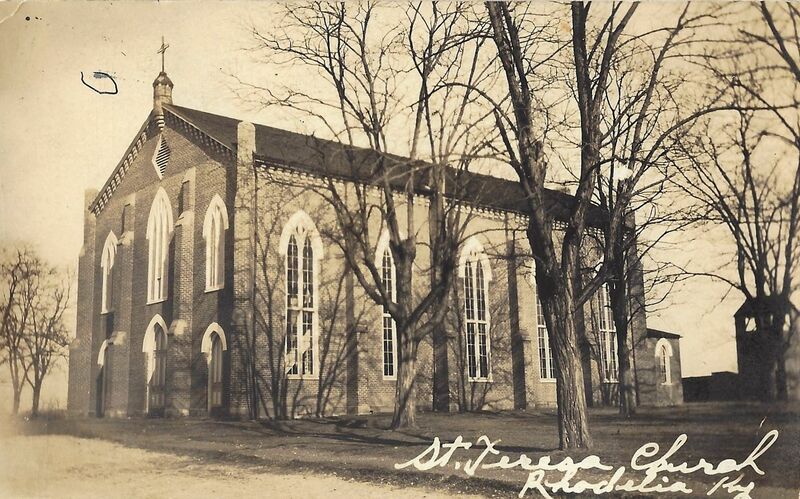 Celebrating St. Theresa's 175th anniversary. His brother Richard and my sister Kaye are married to each other so we share common nephews. For them, I am sure it has been a burden sometimes to have two priest uncles! Todd Ray, Craig Ray, Kaye (Knott) Ray, Richard Ray and Eric Ray. We both went to the parish school (St. Theresa Academy, St. Theresa School and Cross Roads School). I can still remember the day and location when and where Father Ray (we called him "Bud" and I was called "Ronnie. 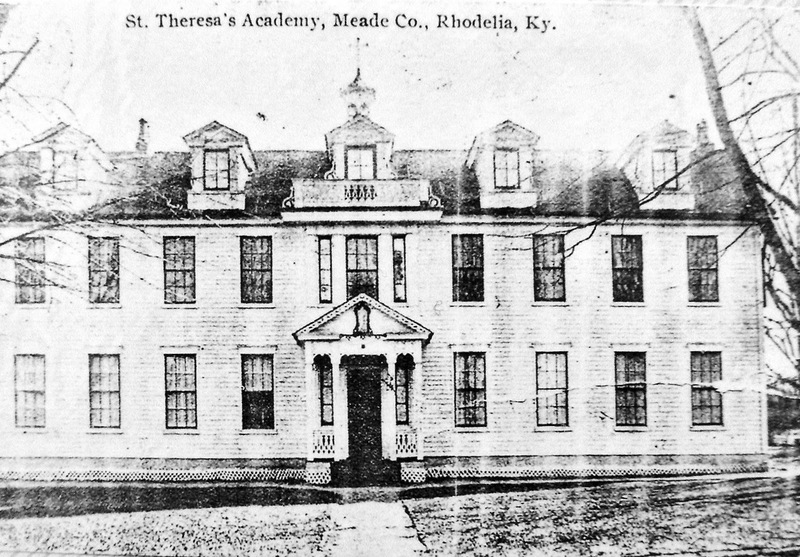 "), told me that there was a seminary in Louisville that took guys out of grade school. 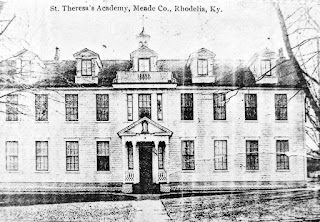 He decided to go to the Catholic high School in Hardinsburg (St. Romuald High School was right across the border in the Owensboro Diocese) where my sister, Brenda, went as well. I decided to go to St. Thomas Seminary in Louisville. Father Ray joined me at St. Thomas for his first two year's of college. When he graduated, he went to St. Mary's Seminary in Baltimore and I went to St. Meinrad's in Indiana. We were ordained a year apart. 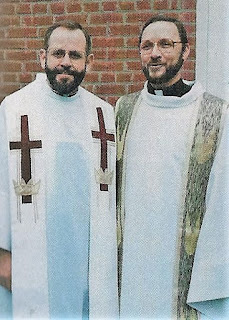 We have both been employed by St. Meinrad in our later years - he as a spiritual director and me as director of the ongoing formation program. There were other Louisville priests from our parish when we were growing up: Father Joseph Henry Elder, Father Henry Lee Egert, Father Paul Manning OFM, Father Thomas Buren, Father Henry Vessels and Father Sebastian Cunningham, OFM, Conv. There have been several Sisters (Loretto, Charity, Ursuline, Dominican and Mercy). 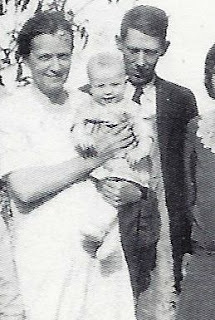 There was one religious brother, Brother Edwin Leonidian Burch of the Community of the Brothers of the Christian Schools. Not bad for a very small parish! Father Felix J. Johnson was our pastor from 1937-1960. 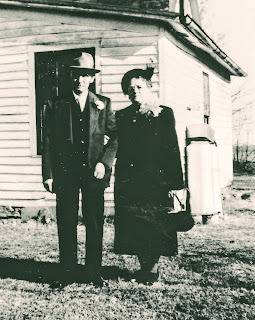 He was your quintessential country pastor/builder/ruler of by-gone days. 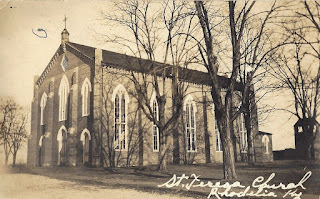 He built the rectory, convent, school, new cemetery and parish hall, laying most of the bricks personally. He raised sheep in the cemetery, offered his services as a "water witch" for people needing to drill for water and general consultant in legal matters. playing in the woods on a Sunday afternoon. 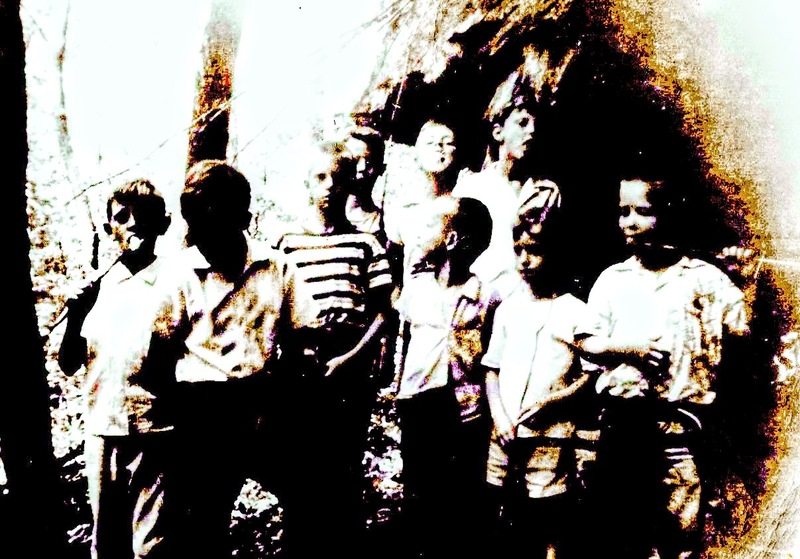 That's me on the left eating a roasted marshmallow with my shirt buttoned to the very top. The rest are Rays, Pophams and Speaks. I shared in his love of horses. That's me on one of his horses. 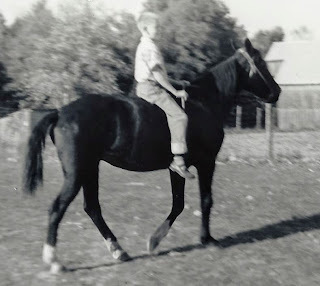 Another shot of me holding the reins while his brother held the bridle. during a summer break from Saint Thomas Seminary. 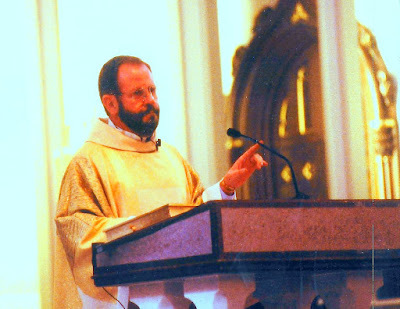 Father Bob Ray's First Mass. On the right, I served as the Deacon, on the left is Father Thomas Buren also from the parish and to the left of him is Father Edward Reavy, a former pastor. 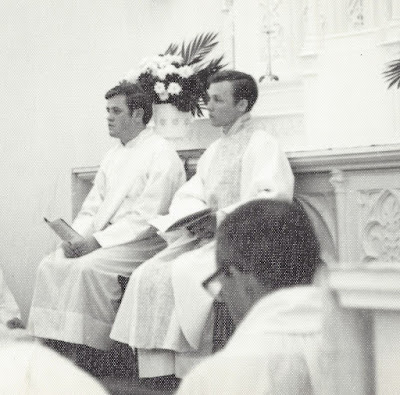 Another shot at Father Ray's First Mass. He still looks younger! 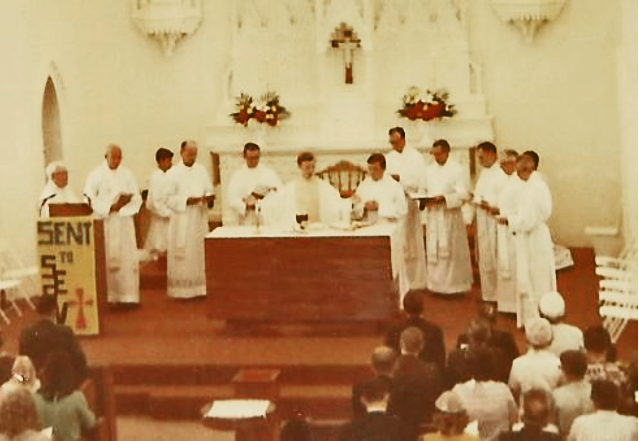 Another shot of Father Ray's First Mass. He looked younger still! On his left, is his brother Richard, my brother-in-law. On my right is his brother, Kenny. 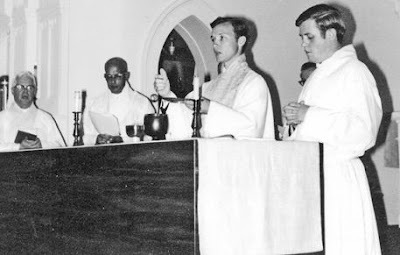 Father Ray's First Mass and My First Mass (below) almost look identical. Father Ray second to the right me. 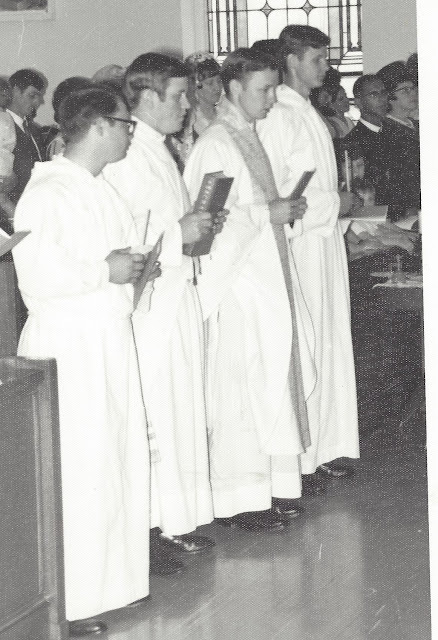 Father Henry,Vessels third to the left of me, also ordained from St. Theresa parish. Archbishop Kelly, Father Ray and myself. We will both be buried in St. Theresa Cemetery, a few feet from each other, as well as a few feet from Father Buren, Father Vessels and Father Johnson. Since Father Ray is older, I guess he should go first? On second thought, I was in the seminary three years longer than he. However, he has been a priest a year longer! "You, first!" "No, you first!" WELCOME HOME, BOYS, WELCOME HOME! 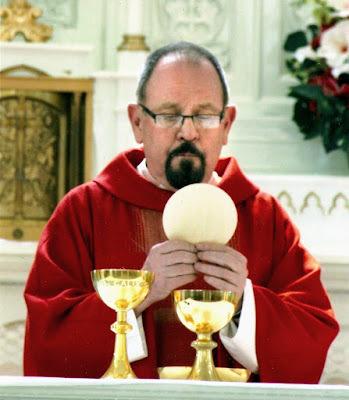 "Priests have as their primary duty the proclamation of the Gospel of God to all. For through the saving Word the spark of faith is struck in the hearts of unbelievers and fed in the hearts of the faithful." "A County Wide Catholic Revival"
Preaching at St. John Church, Mesopotamia, on the island of St. Vincent in the West Indies. 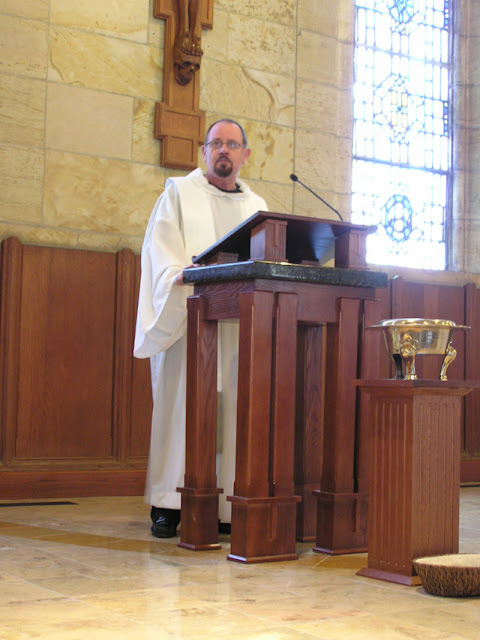 Preaching at Bellarmine University almost every Sunday night for 16 years. 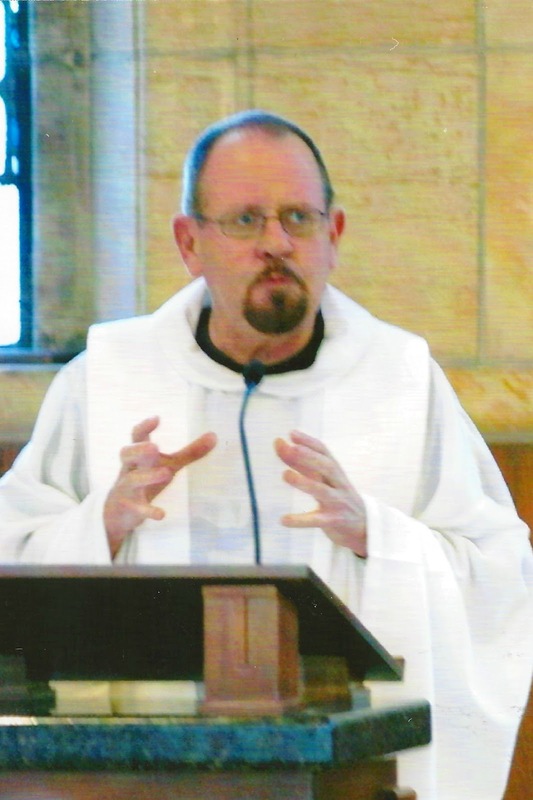 Preaching to the archabbot, monks, retired archabbots of St. Meinrad and retired abbot and monks of Blue Cloud Abbey in the St. Meinrad Chapter Room for a week. 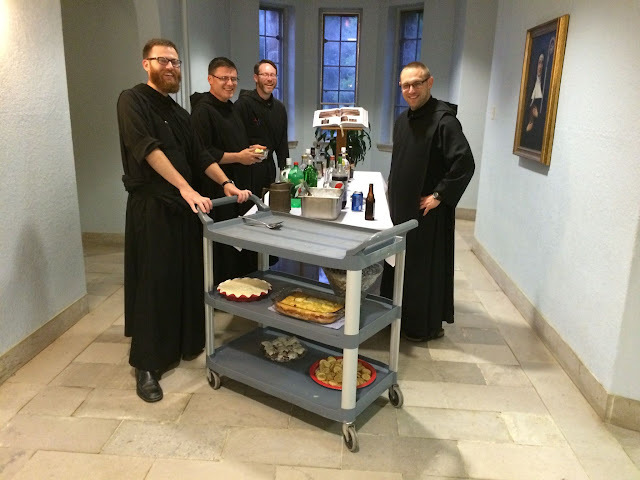 A break after preaching to the monks of St. Benedict Abbey in Atchison, Kansas, for a week. A group picture after a week of preaching to Archishop Neary and the priests of Tuam, Ireland. An official group shot after preaching for a week to Archbishop Weisgerber and the priests of Winnipeg, Canada. A group shot after a week of preaching to Bishop Lori and the priests of Bridgeport, Connecticut. A nice shot of the priests of Little Rock after a week of preaching. I actually preached to Cardinal Collins and the priests of Toronto, Canada, for four weeks! for two weeks, two years in a row. A nice group shot of Bishop Barnes and the priests of San Bernadino, California, at the end of their week long retreat. I preached to the priests of Cardiff, Wales, in this old castle for a week. 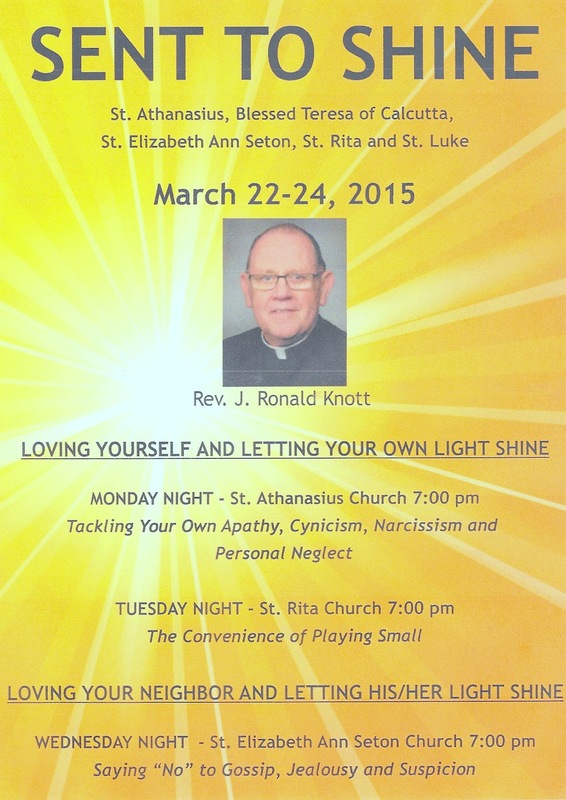 I preached to the bishop and priests on London, Ontario, for a week. 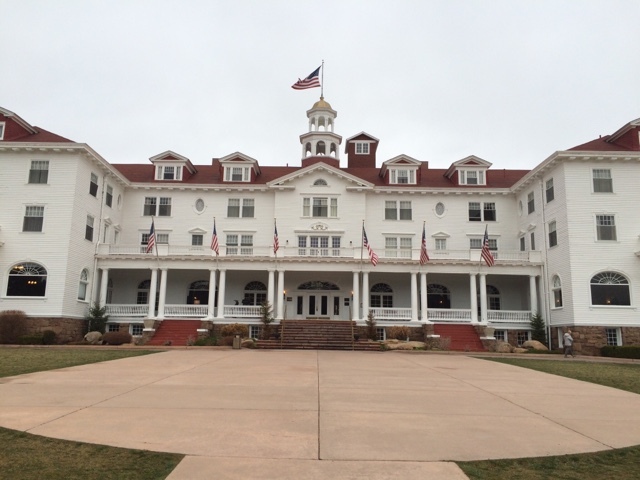 I even preached at the Hotel Stanley (where the movie The Shining was shot) to the bishop and priests of Denver, Colorado, for a week. I preached to the bishop and priests of Richmond, Virginia, for a week as well. 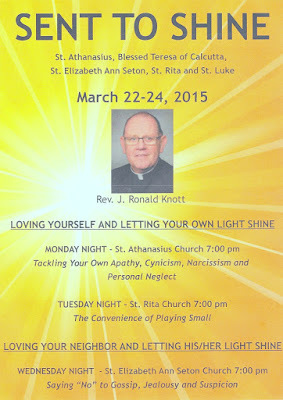 Then there was a week with the bishop and priests of Scranton, Pennsylvania. I will actually be going back again this spring. Then there was a week with the bishop and priests of Regina, Canada. A week of preaching to the bishop and priests of Corner Brook-Labrador, Canada.